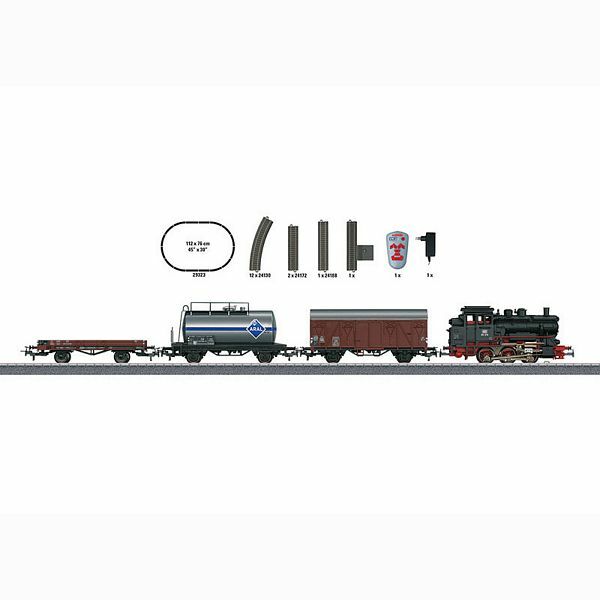 Prototype: German Federal Railroad DB class 89.0 tank locomotive, a type X05 low side car, a boxcar, and an Aral tank car. Digital IR controller for control of up to 4 trains. Freedom of movement all around the layout with the wireless IR controller. Model: The locomotive has an mfx digital decoder and a special motor. 3 axles powered. Traction tires. The triple headlights will work in conventional operation and can be controlled digitally. The locomotive has coupler hooks. The low side car, boxcar, and tank car each have Relex couplers. Train length 45.7 cm / 18". Contents: 12 no. 24130 curved track, 2 no. 24172 straight track, 1 no. 24188 straight track, 1 base station, 1 switched mode power pack, and a wireless infrared controller. This set can be expanded with the C Track extension sets and with the entire C Track program.